The mascots for the 2016 Olympics and Paralympics have been revealed and are inspired by the animals and plants of hosts Brazil. 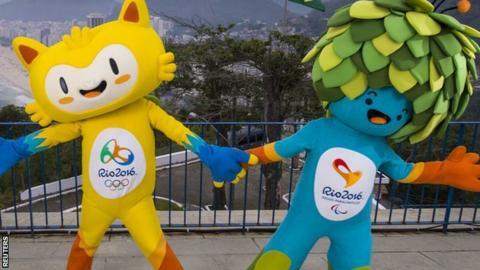 The yellow Olympics mascot represents the animals of Brazil, while the blue Paralympics mascot "is a fusion of plants found in Brazilian forests". A poll will decide their names with the results to be announced on 14 December. The shortlisted pairings to chose from are Oba and Eba, Tiba Tuque and Esquindim or Vinicius and Tom. "The Rio 2016 mascots represent the diversity of our culture, of our people," Rio 2016 brand director Beth Lula said. In describing the mascots, the organising committee said the Olympics mascot combined "the agility of cats, the sway of monkeys and the grace of birds" and that he can stretch his arms and legs as much as he wants. The Paralympics mascot, meanwhile, "is energised by photosynthesis and can pull any object from his head of leaves" and is always growing and overcoming obstacles.